Benedict celebrates Mass at the conclusion of the Synod for the New Evangelization. "For now we can say that this Synod is strengthened commitment to the spiritual renewal of the Church, in order to renew the spirituality of the secular world, and this renewal will be the rediscovery of Jesus Christ, His truth and His grace." 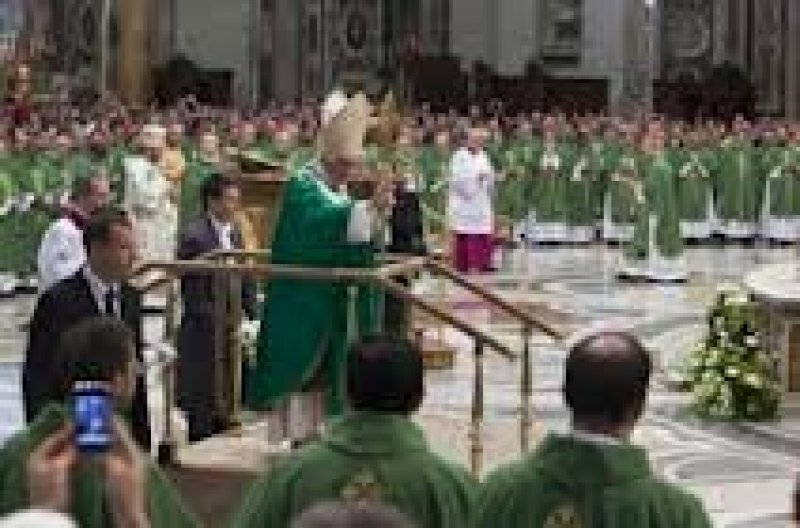 Vatican City (AsiaNews) - The sacraments of Christian initiation, the mission to those who do not know Jesus and to those who, though baptized, do not live the faith. These are the pastoral guidelines for the new evangelization that emerged from the Synod that concluded this weekend and which Benedict XVI outlined during the Mass celebrating its end. There were 49 cardinals and 200 bishops in St Peter's Basilica, gathered for the Synod called to find a way to present, or repropose Christianity to the people of today. In three weeks, from October 7, they developed 58 "propositions", which were delivered to the Pope who will draw from them a single document. In this regard, after the celebration of Mass, addressing the 40 thousand people in St Peter's Square for the Angelus, Benedict XVI said that "now we can say that this Synod has strengthened commitment to the spiritual renewal of the Church itself, in order to renew the spirituality of the secular world, and this renewal will be the rediscovery of Jesus Christ, His truth and His grace, His "face", so human and yet so divine, from which shines the transcendent mystery of God ". "The whole Church was represented - he said - and, therefore, involved in this effort, which will not fail to bear fruit, with the grace of the Lord." Shortly before, during Mass, he had commented on the passage from Mark that recounts the miracle of the healing of blind Bartimaeus. For Mark, says Benedict XVI, Bartimaeus is "a model. He was not blind from birth, but he lost his sight. He represents man who has lost the light and knows it, but has not lost hope: he knows how to seize the opportunity to encounter Jesus and he entrusts himself to him for healing". "Bartimaeus, on regaining his sight from Jesus, joined the crowd of disciples, which must certainly have included others like him, who had been healed by the Master. New evangelizers are like that: people who have had the experience of being healed by God, through Jesus Christ "
And today " the new evangelization applies to the whole of the Church's life. It applies, in the first instance, to the ordinary pastoral ministry that must be more animated by the fire of the Spirit, so as to inflame the hearts of the faithful who regularly take part in community worship and gather on the Lord's day to be nourished by his word and by the bread of eternal life. I would like here to highlight three pastoral themes that have emerged from the Synod. The first concerns the sacraments of Christian initiation. It has been reaffirmed that appropriate catechesis must accompany preparation for Baptism, Confirmation and Eucharist. The importance of Confession, the sacrament of God's mercy, has also been emphasized. This sacramental journey is where we encounter the Lord's call to holiness, addressed to all Christians. In fact it has often been said that the real protagonists of the new evangelization are the saints: they speak a language intelligible to all through the example of their lives and their works of charity.. "
" Secondly, the new evangelization is essentially linked to the Missio ad Gentes. The Church's task is to evangelize, to proclaim the message of salvation to those who do not yet know Jesus Christ. During the Synod, it was emphasized that there are still many regions in Africa, Asia and Oceania whose inhabitants await with lively expectation, sometimes without being fully aware of it, the first proclamation of the Gospel. So we must ask the Holy Spirit to arouse in the Church a new missionary dynamism, whose progatonists are, in particular, pastoral workers and the lay faithful. Globalization has led to a remarkable migration of peoples. So the first proclamation is needed even in countries that were evangelized long ago. All people have a right to know Jesus Christ and his Gospel: and Christians, all Christians - priests, religious and lay faithful - have a corresponding duty to proclaim the Good News." " A third aspect concerns the baptized whose lives do not reflect the demands of Baptism. During the Synod, it was emphasized that such people are found in all continents, especially in the most secularized countries. The Church is particularly concerned that they should encounter Jesus Christ anew, rediscover the joy of faith and return to religious practice in the community of the faithful. Besides traditional and perennially valid pastoral methods, the Church seeks to adopt new ones, developing new language attuned to the different world cultures, proposing the truth of Christ with an attitude of dialogue and friendship rooted in God who is Love. In various parts of the world, the Church has already set out on this path of pastoral creativity, so as to bring back those who have drifted away or are seeking the meaning of life, happiness and, ultimately, God. We may recall some important city missions, the "Courtyard of the Gentiles", the continental mission, and so on. There is no doubt that the Lord, the Good Shepherd, will abundantly bless these efforts which proceed from zeal for his Person and his Gospel.. "